We live in the Earth’s house, so let’s say “thanks” for those April showers that bring May flowers by getting greener in our own homes. The city has just announced it will update zoning rules to allow larger buildings to better insulate, use solar panels and add green roofs, skylights and even wind turbines. 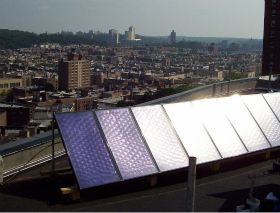 For ideas and resources for reducing energy usage in individual homes, and information about tax breaks for the eco-minded, check out NYSERDA, a public benefit corporation that seeks to reduce energy consumption, promote the use of renewable energy sources and protect the environment in New York. Here are some ways to preserve our resources by choosing how to eco-fit your home. According to Energy Star, a government agency that regulates energy efficient products, the average home in the tri-state area will save $401 per year just by replacing single-pane windows with energy-efficient ones, and $166 per year for all upgraded double-pane windows. Making the switch will cut down heating and cooling bills, as well as the carbon footprint costs associated with those temperature controls, and can give you a tax break. Use the store locator to find places to buy energy-efficient appliances and building materials, which can also be purchased online. New York Windows and Doors provides measuring and installation of various energy-efficient windows and doors, that are e-certified and insured, across the tri-state area. Contact them for a quote. Royal Prime, serving the metropolitan region from its base in Elizabeth, NJ, sells high-end windows and doors. You can even get a stained-glass style window overlay to cut down on unwanted views into your home. Contact them for installation services and prices. Brooklyn Window and Door is currently promoting a $1,500 tax credit for updated windows. List up to five products for a price quote. Harness the sun’s rays with solar panels, which can be installed on almost any roof. With 234 days of sun in the city, you’re sure to reign in a lot. Want to be brazen? Give the do-it-yourself solar panel installation kit a whirl. For a few hundred dollars, climb as close to the sun as you can to save some serious cash in the long run. Installing solar panels on your roof also brings with it a property tax abatement. Only certified installers will qualify for the cash break, so try one of these sun-loving establishments from NYSERDA or use Get Solar, which features a handy savings quote when you enter your zip code and average monthly energy bill. You can even see your roof from a Google Earth-type image. Another way to go green at home is by upgrading your furnace. There are several grades of oil used by furnaces for hot water and heating; number #6 is the dirtiest, #4 is your regular unleaded and #2 is super premium. A state-wide initiative says that by 2030 all new oil heaters must be converted to the cleanest oil, biodiesel, natural gas or steam. So, if you’re in the market to replace yours, keep that in mind. 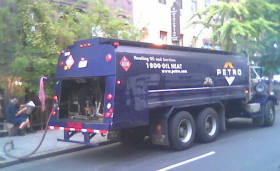 Paragon Oil in Brooklyn delivers all grades with same-day emergency ordering available. They also offer two service plans for the maintenance and repair of your heating system for $100 a year, or $150 including all parts. Skaggs-Walsh will come to your home, replace your oil heater, automatically refill it as needed and provide tune-ups. Call for an estimate or fill out the online form. Are you in the Bronx, Manhattan, Dutchess County or Rockland County? Clover Comfort will sell you a new heating system to replace your current system. If you’re gearing up for summer, also look into an energy-efficient air conditioner to feel good while splayed on the couch. Keep heat in or out with well-insulated walls. 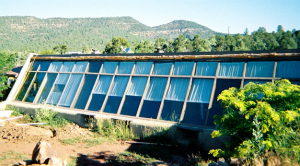 This will not only save you money in your heating/cooling bills, but it will also reduce the energy you use, leaving cleaner skies and waters for the plants and animals who live in lesser-controlled environments. Try one of these places for quotes and insulation services. 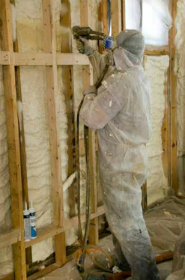 New York Spray Foam offers eco-friendly solutions to any tiny space that needs to be filled. Call for an estimate based on your renovation or retrofitting projects. Keep your climate and late-night jam session (noise pollution to neighbors) to yourself with Brooklyn Insulation and Soundproofing. They offer insulation services for retrofitting as well as new construction projects. Contact them for a quote. The human body may be made up of 80 percent water, but the resource is limited on the planet. In fact, 884 million people worldwide (that’s three times the population of the United States) live without access to clean water. Here are some simple ways you can cut back on your own water use. Replace your old clunker for a high-efficiency flusher. Displace some of the water your toilet uses by anchoring a plastic-wrapped brick or a weighted water bottle in the tank. Check it regularly to be sure it does not interrupt your toilet’s functionality. Buy a toilet dam, which prevents the pump from filling the tank all the way, thereby saving water. Replace the flapper inside the tank with an easy-to-install adjustable one for under $10. Choose a full or partial flush with a dual flush kit, because variety is the spice of life, even in the bathroom. The handy online installation instructions are PDF ready. Buy one for $30 and four for $100, then flush (or half flush) away. Save money on your heating bills and save water with a low-flow shower head. First, test your shower’s output by filling a bucket for 20 seconds. If you have more than a gallon of water in that amount of time, you need to replace your shower head. Purchase a low-flow shower head. Installation will depend slightly on your particular shower, but should be as simple as using pliers to unscrew the old head and replace it with a new one. Tip: to avoid scratching the chrome, wrap the shower head with a piece of cloth before using the pliers. While it may be one of the most basic functions of nature, you can compost in or outside your home with just a little effort. Composting kitchen scraps and yard trimmings saves space in landfills, and also means you take out your trash less often, therefore using fewer trash bags that don’t decompose. 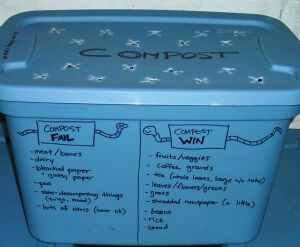 Here are some ways to make composting work for you. Bag up your kitchen scraps and let someone else feed it to the worms. Take compostable material to the numerous Green Markets in the city, conveniently listed by borough here. Learn how to backyard compost at home with a trash bin and a little determination. Drill air holes and make sure the bin has a strong lid. Add food scraps (no meats or dairy) to the bin, and layer with leaves or other yard trimmings. Every so often, roll the bin around to shake things up. Keep it damp by adding a little water every few days when it’s hot. You’ll have organic material to add to your potting soil in no time! Don’t want to drill? Purchase a backyard composting tumbler and save yourself the hassle. Below-ground composting is perhaps the simplest: simply bury a week’s worth of veggie and fruit scraps a foot deep in your yard. Place a paving stone over the top if your yard is stomping-grounds for creatures that like to dig. The soil will become more enriched, and will be very good for planting next spring. Eco Brooklyn Inc is ready with the tools and on-site design counselors to help you refit your treasured home into one even Mother Nature can feel good in. 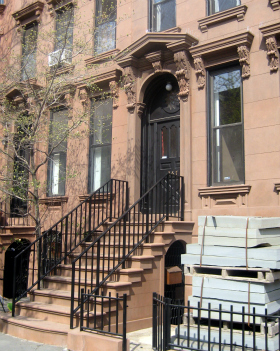 Their Brownstone Gut renovation might be as good as it gets, but if you’re feeling so inclined, you can buy the materials you need to do it on your own. For the last ten years, GRNY Renovations has served the New York area and East New Jersey in renovation and reconstruction needs. Get an eco-friendly renovation with their Green Remodeling services, or if you’d rather start small, get an overhaul in the bathroom or kitchen. Just need a good polish? Try GI Cleaning Contractors for an eco-friendly clean that will pass any white glove test. New customers get $10 off.